We develop and use mapping and geospatial data management and analysis tools to assist clients with wide-ranging needs. Our CV XE GIS software provides an extensive array of features to meet basic and more advanced geospatial analysis needs. We develop custom geospatial software and data resources. Specialists in demographic and economic data, we help clients integrate multi-sourced data for access and analysis. 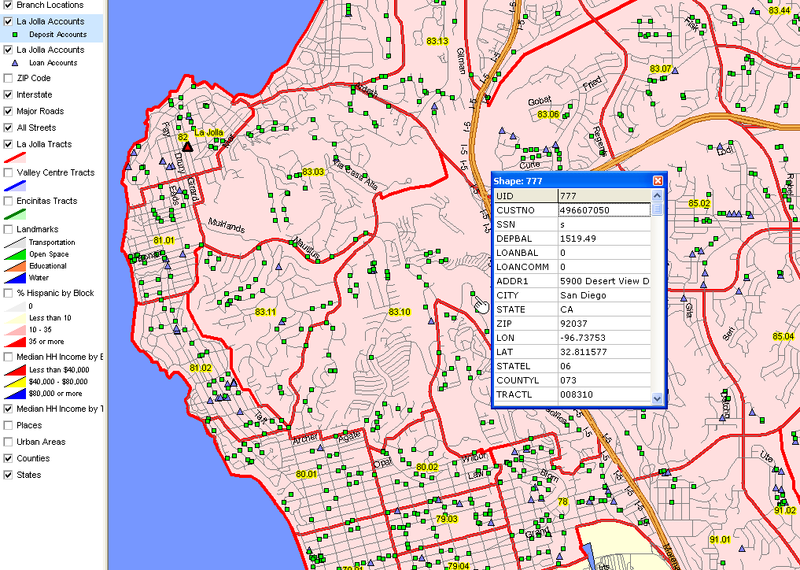 Our tools were used in the Census 2010 LUCA program by local government agencies to improve accuracy and coverage of the Census 2010 TIGER system used to tabulate results of Census 2010 and enable wide-ranging mapping and geospatial analysis. We continue to update, expand and augment TIGER shapefiles. Our tools have been used by statewide university systems to geocode and analyze characteristics of more than 100,000 students. Many school districts/education agencies use the integrated toolset to geocode students and analyze performance and neighborhood patterns. Businesses use the integrated toolset to geocode customer data to examine the nature and distribution of sales. ... add latitude-longitude (L-L) and 15-character census block geocode to your address-based data. ... 15-character code: state+county+tract+block (other options available). ... optionally convert your geocoded address data into a point shapefile for mapping and GIS analysis. Option 1 - we process your address file, attaching L-L and geocode to each address record. Option 2 - you use our geocoding tools with GeoBase roads to attach L-L/geocodes to address records. 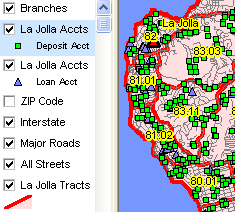 Option 3 - use your geocoding software with the GeoBase roads to attach L-L/geocodes to address records. Contact us for details (mention geocoding solutions) or call (888)364-7656. ... one geocoding logic/processing code with different deployment options. ... use alternative base files: GeoBase, TIGER, your own roads file. Option 1 - secure geocoding -- run Geocoder on your PC with no Internet/network requirement. Option 2 - use Geocoder online -- use our Web-based online service for interactive or batch geocoding. Option 3 - use callable Geocoder on your server: pass one address with geocode return or batch process. Contact us for details (mention Geocoder) or call (888)364-7656.  Points ... address locations, schools, hospitals, among others.  Lines ... roads, railroads, water, among others.  Area/polygon ... statistical area boundaries, political area boundaries, water, other. DMD is updated continuously and covers the United States. Contact us for details (mention GeoBase) or call (888)364-7656. You have the points (latitude-longitude) but how to easily associate them with corresponding census block, block group, tract, ZIP code, etc.? The Point to Census Block software has been generalized to associate any point with its corresponding polygon geocode. See Point to Geocode for more information. Reproject shapefiles to geographic, no projection format using the Proximity Reproject utility ... enabling easier integration with TIGER/Line shapefiles. Complete this form to install the personal use, no fee version (converts any shapefile to no projection). Key in "Reproject utility" in the text section. Install the No-Fee Version of CV XE GIS ... use this version of CV XE with pre-existing CV XE projects, shapefiles and many other types of data. Run the CV Installer (click Install CV XE) and examine CV XE operations with census tract geodemographic shapefiles. Add/view/integrate Census Bureau TIGER/Line shapefiles. Please register here (optional, not required to install) to receive information on updates ... check the checkbox "Registering Installation ...". 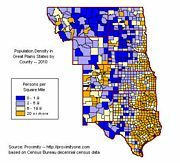 Covering more than 11 million census block areas, wall-to-wall across the U.S., census block shapefiles provide the most granular geographic areas for analysis of Census 2010 demographic data. The census block is the smallest area for which Census 2010 data were tabulated. Census 2010 Census Block Database ... http://proximityone.com/cenblk.htm.